Developed for those with fragile, thin and fine hair, the Denman D33 Gentle Styling Brush features ultra-soft nylon bristles which help to gently separate and shape locks without pulling or tugging. Five rows of staggered pins deliver expert control to wet and dry hair, working to define curls and create a smoother, sleeker-looking finish. The compact size is perfect for styling on the go. 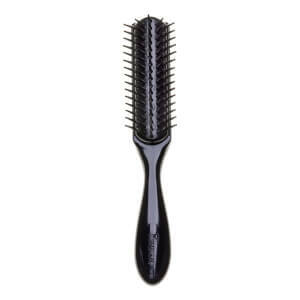 Please Note: The Denman D1 Gentle Styling Brush is not suitable for use with a hair-dryer. Do not use with a hair-dryer. Wash in warm, soapy water. Rinse and leave to dry away from direct heat and sunlight. Remove loose hair from brush with a comb.